"Portland seemed to us to be nearly as great a place as San Francisco. The approach to it is of the same kind, so far as that the railway lands us on the eastern side of the Willamette, and that a big ferryboat transfers us across the river to the city. The city rises from the waters edge and covers what used to be pine clad hills. The depth of the water allows the grain ships to lie alongside the wharves to load, and there is a busy scene with the river steam boats and tugs and ferryboats passing and re-passing. The original wooden shanties are rapidly being replaced by great structures of stone and brick." -Wallis Nash from "Oregon: There and Back in 1877,"
The quote from Wallis Nash is one of the few that likens Portland to the city by the Golden Gate. Besides the level of activity and the "former pine clad hills" (sic), a clue to why can be found with "the great structures of stone and brick" rising by the river. 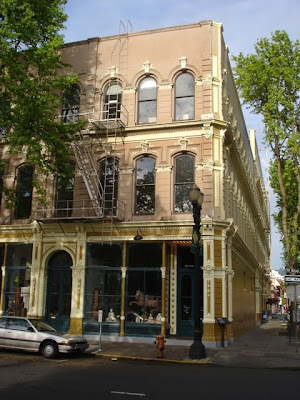 San Francisco's and Portland's ascents were coincident with the height of cast-iron as a building material for the facades of commercial structures. Newcomers like Seattle were still being built largely of wood. 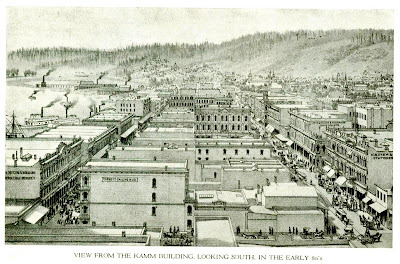 "We are rather inclined to think of early Portland as a frontier town, with limited cultural development compared to our present enlightened state; particularly as respects architecture. 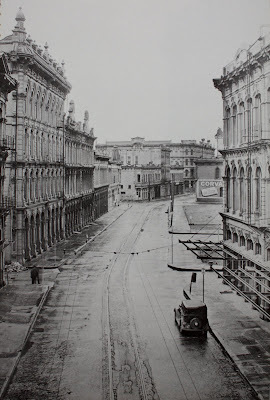 However, one only has to look at the photographs of Front and First Streets taken in the 1880s to realize that era had attained a sophistication which we have seldom equaled in our own time. We excel in size, but can learn from their achievements." -Richard E. Ritz from "An Architect Looks at Downtown Portland" 1991, the Greenhills Press. 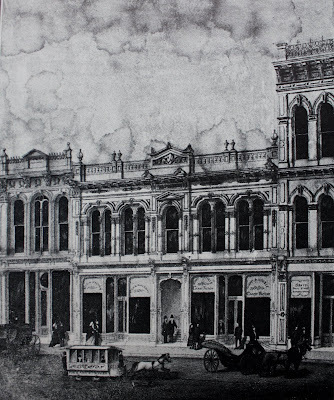 Modern, European inspired, Portland's blocks of Italianate-styled stores, hotels, banks and corporate headquarters laid a template for Portland's aspirations that is familiar to this day. 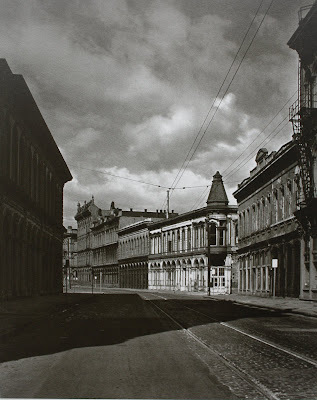 Minor White photograph, Front Avenue in 1939. (click on images to expand). "The Architects of that time were working with the latest technology in commercial construction: cast iron. They were creating not only distinguished buildings, but equally significantly, they were thinking as urban designers, and considering the whole block, the street, the whole city in fact. Notice the rhythm of the repetitive bays, which is carried from building to building, even though the detail is changed for variety, and to provide a distinct character for individual buildings. If this seems to be an accidental result of using the available material, then look at the continuity of the cornice lines and belt courses. Here different owners with different architects have successfully unified four or more buildings on one block. Each block was also related to the next, as also to the block across the street, thus giving the street space a feeling of enclosure as well as linear continuity. Both concepts are largely neglected today." 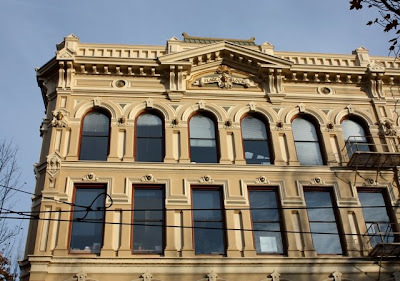 The Alisky and Hegele Building (1878) on First Street between Alder and Morrison. -from "The Grand Era of Cast-Iron Architecture in Portland by William John Hawkins III. 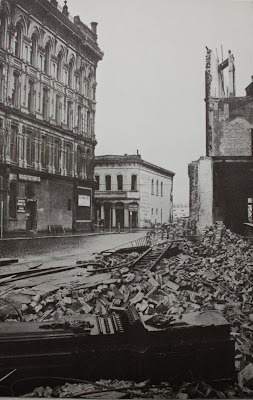 San Francisco's cast-iron downtown was largely destroyed in the earthquake and fire of 1906. 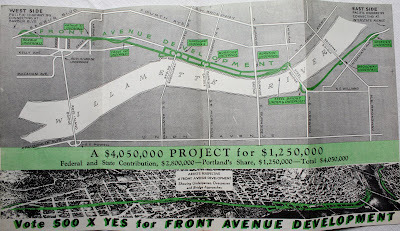 By that time, Portland's downtown had moved inland, with its retail, business and civic districts away from the flood prone river. The riverfront became known as a warehouse and wholesale district, and for Chinatown, along Second Street, which had been there from nearly the beginning. "Portland Jones -He pays the freight." 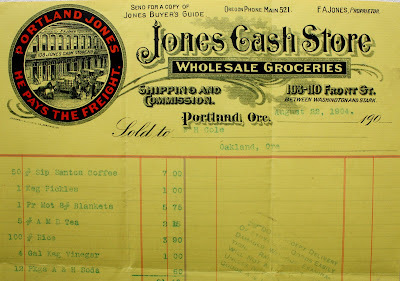 A 1904 receipt from Jones Cash Store, a wholesaler on Front Street between Washington and Stark. Phone number: Oregon Phone Main #521. "In the old business section along the waterfront the narrow streets are still lined with mansard-roofed commercial structures erected between 1860 and 1890, with brick, wood, cast-iron and ornamental plaster facades -all of dubious design. 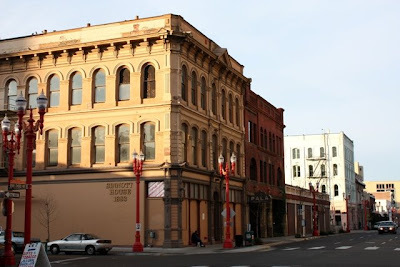 Today these buildings that were formerly important retail business houses are given over to the wholesale trade and to Portland's Chinatown." -from the WPA compiled "Oregon, End of the Trail, American Guide Series," 1940. Minor White photograph. Front Avenue 1940. "Vote For Progress- Vote 500x Yes for Front Avenue Development" brochure (1940). 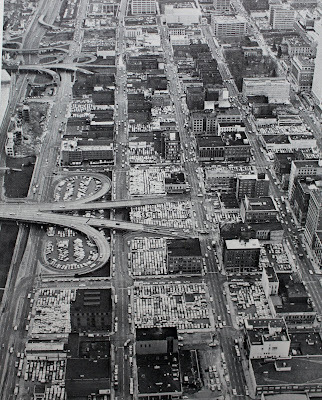 The riverfront downtown remained largely intact into the early 1940s when "improvements" to Front Avenue (the creation of the Harbor Drive freeway) lead to the demolition of every on its east side. It was the start of a process that continued into the 1950s and 1960s, fed on by the addition of new bridge approaches and acres upon acres of surface parking lots. "Beautification -Removal of old buildings, landscaping of waste land, and development of scenic parks along the Willamette River would make Portland's waterfront one of the most beautiful in the country." -Vote 500x Yes brochure arguing in favor of what would eventually be known as the Harbor Drive freeway (1940). -Photo courtesy of Brandon Spencer. Preservationists, such as Eric Ladd, Jerry Bosco and Ben Milligan worked tirelessly to save what remained of the old downtown, often arriving during demolition to save fixtures for future use. 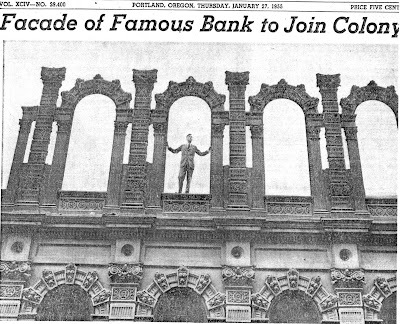 In 1973 architect William John Hawkins III (author of "The Grand Era of Cast Iron Architecture in Portland) formed the Portland Friends of Cast-Iron Architecture, a group to advocate for the area's preservation. In 1975 the "Skidmore Old Town National Historic District" was added to the National Register of Historic Places. It was designated as a National Historic landmark in 1977. Rising property values and extensive transit access meant that many of the surface parking lots in the area will be converted to higher use. This has generated the need for new design guidelines for the district. Those guidelines are now nearly complete. There is much to like. They encourage Italianate architectural elements and the re-introduction of Portland's large inventory of saved cast-iron fixtures. On December 18, 2008 the City Council will make a decision that could drastically affect the future character o f the Skidmore Old Town National Historic District by removing pre-existing zoning to allow development up to 130 feet (13 stories) on select sites within the district. "The historic context of this Historic District is a major city asset, and along with new investment, can attract greater activity and benefits to the area. Recommendations for potential updates to the Skidmore / Old Town Historic District design guidelines may help promote contemporary high quality projects that are compatible with the historic buildings character and scale. Specifically revised design guidelines can help rebuild a continuous vibrant streetscape edge in the district." -The Portland Development Commission's Ankeny Burside Framework Summary 2005 (emphasis added). 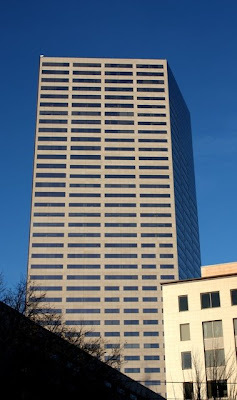 The current code limits building heights to 75 feet, which meshes with the historic 3 to 4 floored, 30 to 60 foot high buildings common to the area. The limits are similar to those that protect historic districts in Denver, Boston, St, Louis, Seattle and Vancouver BC. To nearly double the limits to allow development up to 13 stories would greatly change the historic fabric and nature of the Skidmore Old Town National Historic District, even to the point of threatening its status as a National Landmark (the National Park Service is highly critical of the change). The strongest argument against rezoning is obtained by direct observation. 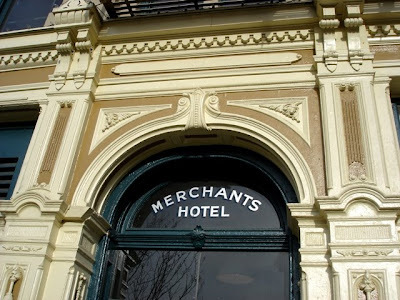 The Merchants' Hotel Building (1880) designed by Portland architect Warren H. Williams, on the corner of NW Second and Davis. The picture is taken from a surface parking lot that, if rezoned, would allow a 13 story building to tower over the landmark building. In fact, the Merchants' Hotel would be bracketed on both east and west sides (NW 3rd and Davis) by higher rise development if the zoning for the area is revised. 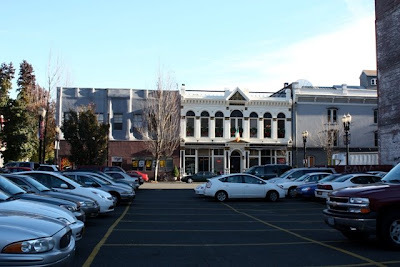 If rezoned, a new building constructed on the parking lot at SW 2nd and Ash would dwarf the block the holds Glison's Building (1889) better known today as Kell's Irish Restaurant and Pub. 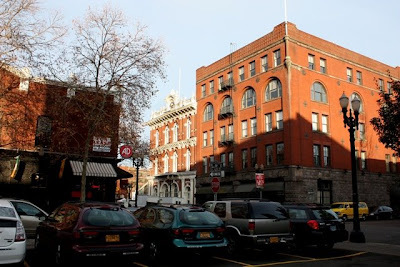 Glison's Building (yes, that Glison) was the last cast-iron building constructed in Portland. Next to it, hidden under a ghastly remodeling job, is the Phoenix Building (1879) which once housed the nationally famous Povey Brothers Art Glass Works. One can hope that it will eventually re-emerge as its namesake portends. The Richardson Romanesque styled New Market Annex (1889) is one of the higher buildings in the district. It too would be overshadowed by a 13 floor building between SW 2nd and 3rd along Ash Street. The Sinnott House (1883) would be exempt from the zoning change. Not so the low rise building beyond it that once held the Kida Company or one of Portland's better urban whimsies, the facade of the Simon Building (1892) which encloses a surface parking lot. Higher rise development there would also bracket the Merchants' Hotel Building on its west side across the street. 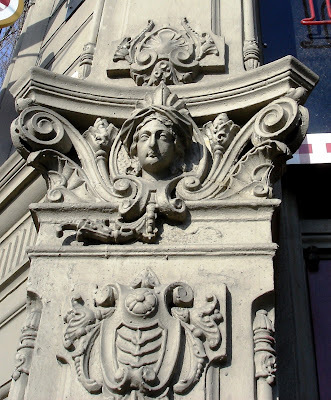 The facade of the Simon Building (1892). "...the riches of a city." 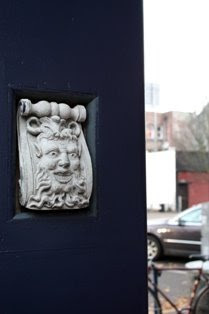 A growing number of Portlanders have become aware of the impending threat to the character of the Skidmore / Old Town District. They are mobilizing to add their voices to a debate that up to now has been confined to narrow interests. A city-wide discussion needs to take place but there is very little time. The City Council votes on the issue on on December 18, 2008. Advocates of Skidmore / Old town urge the City Council to vote down the height changes, or, at the very least, postpone action until a broader airing of viewpoints is accomplished. If stewardship of Portland matters to you, the City Council needs to know. Letters should be written, emails sent, both to the council and to media outlets. If you want to get in touch with this effort, which was started by Portland State University's Virginia Butler, e-mail me at d (my first initial) haneckow (my last name) @ comcast.net. 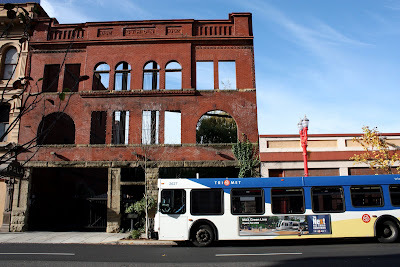 The future of Portland's most historic place is now. There are great opportunities and there are mistakes that can only be made once. We have to be involved. "...We excel in size, but can learn from their achievements."